As of October 9, Nikki Haley resigned from her position as US ambassador to the United Nations. She had assumed the office in January of 2017 and had since then created a positive name for herself on both sides of the aisle. An April 2018 poll from Quinnipiac found that Haley had an approval of 55-23 rating among Democrats and 75-9 amongst Republicans (Vox). Especially in these ideologically polarized times, it is surprising that one of President Trump’s most trusted allies could possess such high favorables. Haley is different than the many other resignations that have flown out of the Trump administration because of her outspoken attitude towards human rights and her well-known contempt for Russia. Her willingness to speak her mind has landed her a central role in the international community. However, her resignation came as a surprise to all. President Trump praised Haley’s work following her announcement saying that “she’s done a fantastic job” (Vox). Compared to all the other people who have left this particular administration, this has been possibly the best send-off from President Trump. This shows just how trusted she was by the President. Haley has been able to channel the voice of the public by repeatedly calling out Russia for its indiscretions. Regardless of what President Trump thinks, Haley has constantly condemned Russian human rights abuses in Syria and the war in Ukraine. In an untraditional GOP presidency, Haley was a traditional voice that lent an ear to the extensive rights of people. 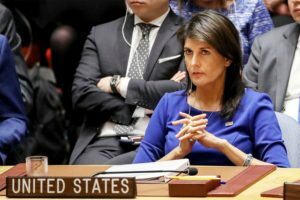 Now without Nikki Haley, what will the relationship between the US and the UN become? Did Haley leave her position to run for the presidency? It would make sense considering that she has high approval ratings, kept out of the public sphere, and has strong support within the Republican party. Suspicions about the new Ambassador to the UN have been Ivanka Trump, Richard Grenell, who is currently the US ambassador to Germany, and Dina Powell, who is a former Trump official (The New Yorker). 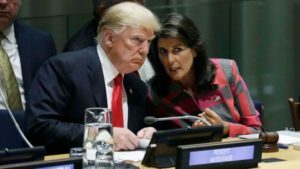 Only time will tell who President Trump chooses and if Haley has her eyes set on the Oval Office for 2020.